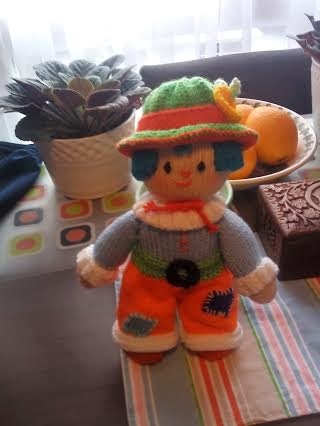 I have finished my first knitted doll for the New Life Foundation. In the book he is called Bertie I however want to give him a different name but cannot think of one. So maybe if you can think of one you could leave a comment and I could pick one. My husband thinks he looks more like Pinocchio or a little Tramp. He was fun to make and a great way to use up more stash, all of Jean Greenhowe patterns are easy to follow and the instructions clear which is always a bonus for me. Trust me I can get lost with some instructions so I always pick easy patterns. So this is the first item I have made for New Life I hope they will like him. Thank you. 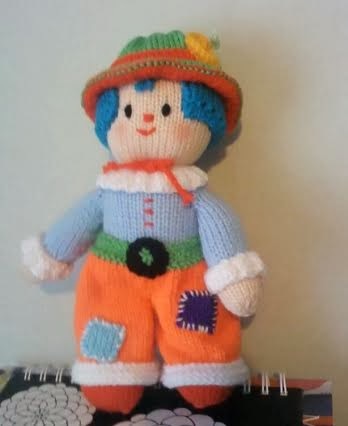 I asked on my knitting forum as well for a name for my little clown and Patches was the winner so Patches he is. This clown is so cute! I love the hat and the patches on the pants!